Bruce “Bugsy” Comben was a hugely popular and loyal servant of the Carlton Football Club for more than fifty years. After earning wide appreciation for his courage, honesty and reliability on the field in his 188 games between 1950 and 1961, he went on to further serve the Blues in many other administrative roles, as diverse as committeeman, selector, player’s representative, recruiting officer and team manager. And it all began with the toss of a coin. Bruce and his older brother Bill Comben hailed from Werribee South, where their parents ran a local grocery store. In 1946, at the tender age of 15, Bruce joined Bill at Carlton and quickly won a place alongside his brother in the Under 19 team. Both boys showed promise and were determined to play VFL football – before a major problem arose. As the post-World War II recession eased, the family business began expanding, and it was painfully obvious that both lads couldn’t be spared to chase their dream. One of them would have to put the family first, and give up league football for a career in the grocery trade. They tossed a coin to decide the matter, and it was Bruce who called right. Bill returned home for good to help secure his family’s future, while forging a solid career as a player, captain and captain-coach of Werribee’s VFA side. Meanwhile, Bruce developed into a star rover with the thirds at Carlton. He was just 175 cm and less than 75 kg (although later in his career he would fill out to 79 kg). Nevertheless, he was fearless, creative and an excellent reader of the ball off the packs. He was also a glorious long drop kick on the run. In 1950, at the age of eighteen, Bruce leap-frogged the seconds and was named to make his debut as second rover in the Carlton senior team. He was allocated guernsey 15 and wore it proudly for the next eleven seasons. As he had for all his time at Princes Park, he continued to hitch-hike to and from training along the Princes Highway, often not arriving back home until after midnight. And it was also at about this time that he was given the nickname “Bugsy” by the Carlton trainers. Because wild rabbits were plentiful at that time in the paddocks around Werribee, Bruce often trapped them for the dinner table and brought any extras to the club. The trainers began calling him “Bugs Bunny”, soon shortened it to “Bugsy”, and the name stuck. By 1952 Bruce was a fixture at first rover for Carlton, as the club entered a decade that would later be described as the Dark Years. From 1952 to 1961 the Blues made just four finals appearances, and lost each of them. Disputes at committee level split the club, and this disunity was reflected in performances on the field. Through it all, Bugsy was one of the shining lights. He hated the losses as much as anyone, but his natural cheerful disposition and sense of humour helped immeasurably to lighten the gloom. Carlton’s President for the first part of Bruce’s career was the visionary K.G. (Kenneth) Luke, who fancied himself as something of a strategist. Without telling coach Percy Bentley, Luke began asking Comben to tag the opposition’s star rovers, like Bob Rose of Collingwood, South’s Bob Skilton and North Melbourne’s Mick Aylett. When Bugsy was successful – as he often was – Luke would slip a 20 pound ($40) note into one of Comben’s pockets after the game. In a time when the average wage was 30 shillings ($3) and VFL players earned 5 pounds ($10) a game, it was a huge incentive. And the perfect apprenticeship for Bruce’s new challenge in the last line of defence. Season 1954 marked a turning point for Bugsy and another step up in his standing in the game. He fitted into the back pocket at Carlton and became an even better player. Relentless, committed and a superb reader of the play, it wasn’t long before he was revered at Princes Park, and respected by friend and foe alike. Later that year, he was selected in the Victorian state team, and went on to wear the Big Vee in nine interstate matches. He won our Best & Fairest in 1957 and 1958, and captained the club from 1958 to 1960. One distinction Bugsy also earnt (but always wished that he hadn’t), was that of being the captain of the first Victorian team to be beaten by Tasmania – at York Park, Launceston, in June 1960. In fact, he was captain-coach of the side – appointed while the plane carrying the team was flying south. The Vics were expected to win easily as usual, but ran into a disciplined Tassie team and lost by seven points. Bugsy retired from VFL football after the 1961 season, and spent the following year as captain-coach of Werribee. In 1962 he was elected to the committee of the Carlton Football Club, and another long and valuable period of service began. At home in Werribee, the family store had become a supermarket, with another already open at nearby Laverton. Bruce stood for election to the Werribee Shire Council, was successful, and spent the next 34 years in chambers – including two terms as Mayor. At Princes Park, he was equally busy. Yet throughout his years on the committee, including a term as Vice-President, Bugsy never lost touch with the grass-roots of the club, and there were few areas of the administration that he didn’t become involved in. Bruce genuinely liked people – especially Carlton people. On training nights, you could often find him sharing a beer and a laugh in the trainers room, or chatting to the diehards on the terraces in front of the Heatley stand. His love of the Navy Blue was never in question. 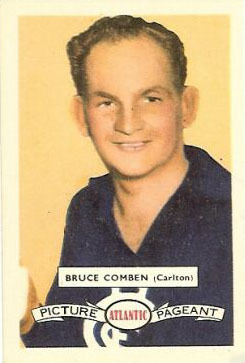 Bruce Comben's father Aubrey also played for Geelong. In 1982, Bruce was awarded an OAM (Order of Australia Medal) for services to the community, and to Australian Football. In 1989, while still serving on the Club Committee, he was inducted into the Carlton Hall of Fame. That same year he was presented with the VFL Jack Titus Award for his outstanding contribution to the game. In May, 2000, he was named in the back pocket in Carlton’s Team of the Century. In late 2001, he retired from the committee of the Carlton Football Club after 51 years of dedication. And in December 2002, Princes Park lost one of its treasures when Bruce “Bugsy” Comben passed away, at the age of 72. In 1949, Bruce wore guersey no. 9 whilst playing with Carlton Reserves. Umpires have been doing a bit of talking lately. In the Carlton and Melbourne game (a Blues victory) goal umpire Jack Lee was the kookaburra. Carlton's Bruce Comben was knocked over by Melbourne's Ian Ridley after Comben had kicked the football. Umpire Alan Nash paid a free down field, and the two players exchanged words. Then umpire Lee ran out and had words with them - but after the game there were no reports. It seems Umpire Lee works for a cash register company and one had just been installed at Comben's Laverton shop. Comben said that Lee wanted to know how he liked it - a likely story. - 100 Years of Australian Rules Football. Two years after "Bugsy's" retirement, a third brother, John Comben made his debut for the Blues and went to play 38 games. Contributors to this page: Jarusa , Bombasheldon , PatsFitztrick , molsey , WillowBlue , pblue , true_blue24 , steve and admin . Page last modified on Wednesday 10 of May, 2017 18:19:54 AEST by Jarusa. 1971 Rd 3 - Jezza and Ray Biffin clash.